Updated edition with more info about B2B and B2C marketplaces around the world. 70 new marketplaces added – now totally 209 online marketplaces are listed in this book. E-commerce websites, marketplaces, auctions and directories are organized by continent. Tips and tricks for finding international and local business partners. 209 ways to find new business online. Find the best online shopping malls on the internet. Are you looking for business angels, co-founders, suppliers and customers? Maybe you’re the business owner and are missing business partners. Do you need co-founders and funding to launch your start-up? Do you know where to find the best suppliers? Do you need funding to fulfill your dream? You should also know about how to check the background of new business partners to avoid being cheated? Maybe you want to visit a trade show, but they’re very costly. Did you know there are also digital fairs, which will save the travel and hotel cost for you? 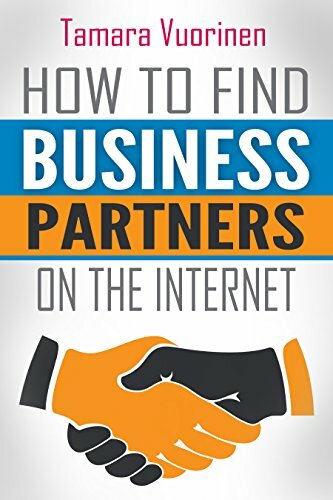 In How To Find Business Partners On Internet, you’ll learn where on internet you can meet new business partners and sell your products. With this book, you’ll have access to detailed information about e-commerce sites, investor networks, online marketplaces for handmade, B2B marketplaces, online shopping malls, B2B directories, online fairs, business forums, online auctions, business networks, online exhibitions, B2B databases, trade show websites, B2B search engines, liquidation marketplaces, providers of credit information, manufacturing marketplaces, and much more. If you’re exporter, importer, trader, buyer, seller, supplier, manufacturer, retailer, wholesaler, purchaser, entrepreneur, investor, business angel, founder of start-up, export manager – you will get valuable information about online marketplaces with different e-commerce models such as B2B, B2C, C2C, C2B, B2B2C, B2G, M2B and M2C across the globe. You will also find the table with Alexa rank over all the online marketplaces mentioned in this book. Alexa rank is an estimate of website’s popularity and you can see what are the most popular online marketplaces with huge number of visitors in the world.